Glasgow Labour MSP Anne McTaggart has today signed up to “Carer’s Labour Network” which was launched by the Scottish Labour Party alongside Carers Champion Claire Lally. The network aims to build on the commitment already shown by Labour towards carers whilst pledging to bring forward practical initiatives to issues they face, including providing Young Adult Carers access to SAAS dependency grants which currently stands at £2,640 per year. The Carer’s Labour Network pledge to ensure accountable, transparent and responsive support and services for Carers. This will be achieved through giving the Care Inspectorate responsibility over inspecting carer’s services and requiring local authorities to do yearly reports on Carer’s support and services. The Network also commits to ensuring young carers get the support they need through fully committing to the Scottish Youth Parliament’s Care, Fair, Share campaign. 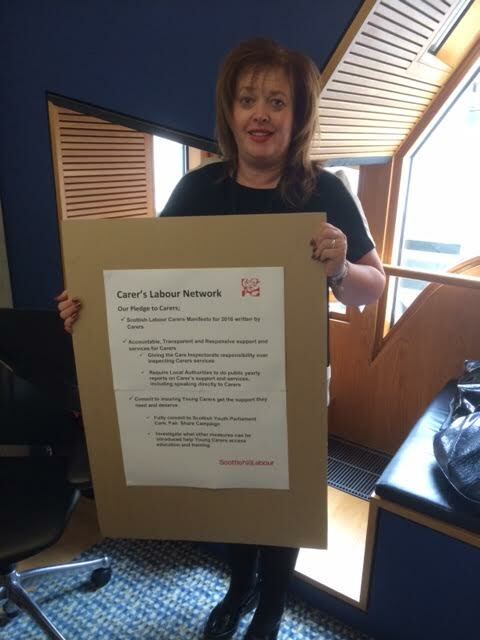 The Carer’s Labour Network will build towards launching a Scottish Labour Carers Manifesto for the 2016 Scottish Parliament elections that will be led by Clare Lally and written by fellow carers. Local MSP Anne McTaggart is urging carers across Glasgow to sign up to the Carer’s Labour Network and make their voice heard ahead of the next Scottish Parliament Election. “Scottish Labour has long been committed towards ensuring the best possible support is available to carers across the country. “The Carer’s Labour Network will continue this work and ensure that the services available for carers are accountable and responsive to their needs. “Currently there is little concrete information on exactly how the £112 million Scottish Government funding for carers has been spent. “As a result carers find it difficult to access information, with no independent body to raise any concerns they may have. Giving the Care Inspectorate responsibility over carers service will insure accountability and transparency across the board. “Part of Labour’s pledge is to listen to the needs of carers and find out first-hand the problems that they face. “By listening to carers like Clare we will be able to hold the Scottish Government to account and deliver the step change needed in support for Carers. “I’m delighted to announce Scottish Labour pledges for carers and pleased that my role as Carer’s Champion has resulted in concrete promises that will improve the lives of carers across the country. “I’m especially excited to play a role in developing a Scottish Labour Carers Manifesto for the 2016 election. By having a manifesto written by fellow carers we can address the problems we face in our everyday life. This entry was posted in Uncategorized and tagged carers, Scottish Labour Party. Bookmark the permalink.